Banh bao are the larger ones, and the kaliji bao are the smaller ones. 1. Heat the vegetable oil in a wok or pan. Sauté the onions for one or two minutes until soft. Add garlic and ginger to the wok/pan and cook another 2 minutes. 2. Add diced chicken to the wok/pan and stir. If using coconut milk, add it here and completely coat the chicken. 3. Add oyster sauce, curry powder and 5 spice to the chicken mixture, stir fry for one minute. 4. Mix cornflour and stock together and then add to the chicken mixture. 5. Stir well and keep cooking until the mixture thickens, 1 or 2 minutes. 6. Remove from the heat and stir in the cilantro. Transfer to a bowl and set aside to cool completely before using. The filling can be prepared up to 2 days in advance, covered with plastic wrap, and refrigerated. Probably should have used more filling for this batch. 1. Scald milk and then stir in sugar, oil and salt, leave to cool until it is lukewarm. Once it is the right temperature add yeast, leave until yeast is activated and it becomes frothy, about 10 – 15 minutes. 2. Sift flour in to a large bowl. 3. Add milk/yeast mixture to the flour. Bring the flour mixture together with your hands. 4. Place dough on a lightly floured surface and knead for approximately 10 minutes. The dough should be smooth and slightly elastic. 5. Place in a lightly oiled bowl and cover with a damp cloth. Leave to rise until it is double in size. This will take from 1 – 2 hours depending on weather conditions. 6. Punch down dough and divide in to 20 equal portions. 7. 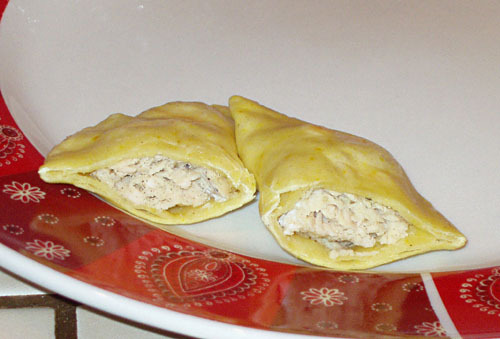 Roll each dough portion in to a 7 – 8cm (2¾ – 3 ¼ inches) round. 8. Place 1 tablespoon of filling in the centre of the round, gather the edges together at the top and place on a 8cm (3 inch) square of baking paper. Repeat until all dough has been used. 9. Cover and let rise for 20 minutes. 10. 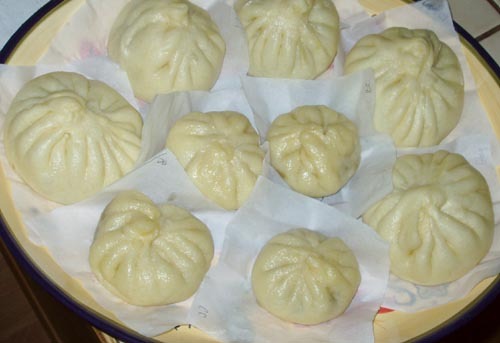 Place buns in bamboo steamer, leaving space between the buns. 11. Heat water in a wok until it is simmering and place steamers one on top of each other in the wok. 12. Place lid on top bamboo steamer and steam for approximately 12 minutes. I have not tried these with coconut milk, since I liked it just fine without it. I’ve done them with and without cilantro, and I’ve tried it with both chicken and pork (pork filling was a little more substantial than the pictured chicken filling that seemed sort of flat). Chicken with cilantro, sans coconut milk, is by far the best route. 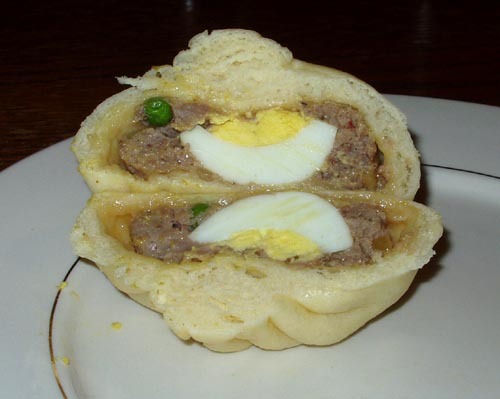 I originally found this on the LA Times archived recipes as “Gali Ji Bao”, and I said “hah! Golly Jee Bow”, so I had to make it. Glad I did, too; these were the boy’s favorite out of the bunch. 6. Punch down dough and divide in to 16 equal portions. 7. Roll each dough portion in to a 3 1/2 inches to 4 inches round. 8. For each bánh bao, roll out dough. Put approximately 1 tbsp of raw ground meat in center, top with egg quarter, and press 3-5 slices of Chinese sausage around the meat. Pleat dough around and around, gathering edges together on top. Pinch to seal well. Repeat until all dough has been used. Place on 4 inch square of parchment paper. Let rest 20 minutes. 9. 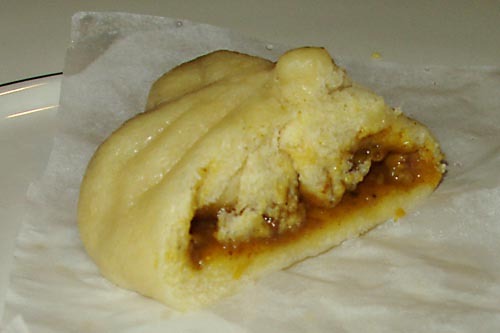 Place buns in bamboo steamer, leaving space between the buns. 10. Heat water in a wok until it is simmering and place steamers one on top of each other in the wok. 11. Place lid on top bamboo steamer and steam for approximately 15 minutes. Bánh Bao are typically made with quail eggs, but I don’t have access to those, so I just used some quartered chicken eggs. You can substitute andouille sausage and a pinch of crushed red pepper for the Chinese sausage, but it’s not quite the same. 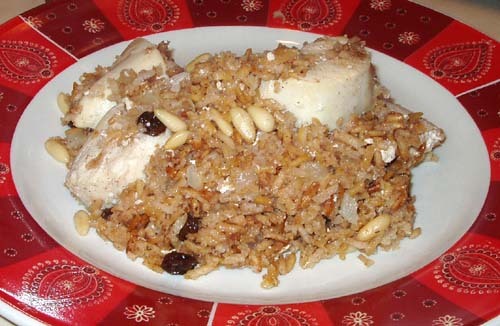 Originally titled Lebanese Chicken and Rice with Pine Nuts, Raisins and Feta, this recipe comes from Nutrition Consultant Jeannette Turner, but I couldn’t find exactly what was Lebanese about it. Maybe if you swapped cinnamon for 5 spice. Optional step I enjoy: Soak raisins in 1/2 cup of cool water, set aside. In a large skillet or frying pan on medium high heat, cook rice in 1 Tbsp of oil until well browned. Cook rice with 2 cups of water, salt, cinnamon, bay leaves, and honey according to the directions on the package (hey, I use a rice cooker, so you’re on your own). 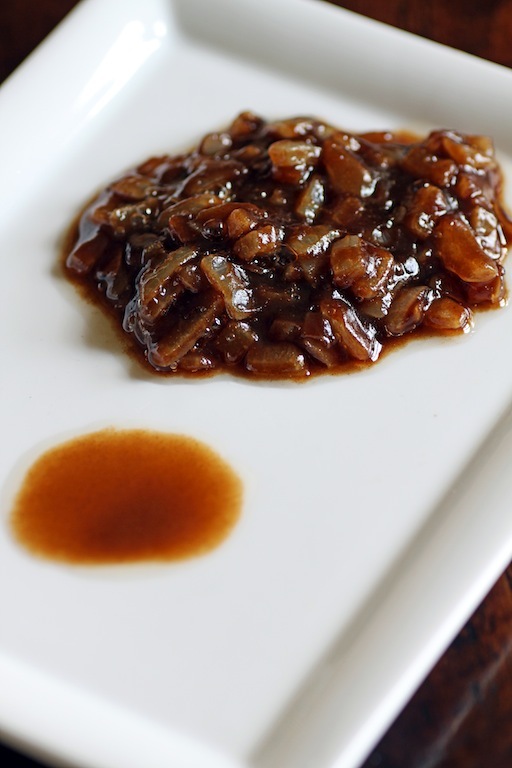 While the rice is cooking, fry chopped onions in 1 Tbsp of oil in the same skillet or pan 5-10 minutes or until golden brown. Add chopped chicken pieces and cook thoroughly (about 10 minutes). Drain raisins and add them with the pine nuts to the skillet. Cook for 2-3 minutes. Remove bay leaves from rice. Combine rice and chicken mix into a large baking dish. Top with feta and broil for 5-8 minutes (or until the feta melts and starts to brown on top). If you’re using feta cheese, this broiling is vital because it changes the smell and taste of the feta. I served mine with butternut squash, but I hear it goes well with green vegetables, too. This recipe is easily converted to vegetarian/vegan, for either main course or side dish. Peta, of the blog Peta Eats, was our lovely hostess for the Daring Cooks’ September 2011 challenge, “Stock to Soup to Consommé”. We were taught the meaning between the three dishes, how to make a crystal clear Consommé if we so chose to do so, and encouraged to share our own delicious soup recipes! 1 cup (240 ml) (60 gm) (2 oz) coriander (cilantro) (Reserve 18 of the smallest leaves and 6 of the tips for service) wash the rest of the bunch including the roots. Recipe makes about 48 wontons only 18 are used for this recipe. The rest can be frozen uncooked for other occasions. 500 gm (1 lb) chicken breasts or tenderloins with the tendon removed. 1. Cook your bones and chicken until brown. 2. Sweat the vegetables in the oil or butter until soft. 3. Put ingredients in a stockpot and cover with cold water. 4. Cover with a lid, then bring to a boil on medium-high heat. 5. Reduce heat to medium-low. Simmer uncovered, skimming foam from surface, for 2 hours or until meat falls from bone. Lift out the chicken and keep for another use. 6. 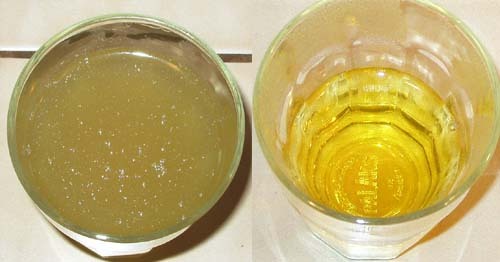 Strain stock through a muslin-lined sieve. Discard solids. 1. Fry the mince until brown and cooked. Allow any juices to cook off. You don‟t want any burnt bits as it will make your stock bitter. 3. Skim off any fat. 4. Strain the soup to remove any solids. Stop here and serve with wontons. Allow 1 cup/240ml per serve. Or move on toward Consommé. 1. Place egg whites in a bowl. This is the time to taste your stock and decide if it needs more flavourings or salt and pepper. Add seasoning to the egg whites. 2. Whisk the whites to a bubbly froth and add the crushed ice. 3. Add to the cooked meat. Mix together. 4. Add this mixture to the simmering stock. Whisk for a slow count of three. 5. Let it heat slowly back to a simmer. Don‟t stir it again. 6. The raft is a delicate thing. It is vital it doesn’t break apart (if it breaks apart it will all mix back into the soup and you’ll have to start again with the egg whites. ), you want to bring it up to a simmer very slowly. Keep a close eye on it. I try to push the middle back so I get a good hole. Once the raft is substantial, break a little hole in it if there isn’t already one. 7. As the consommé simmers, you will see bubbles and foam, come up through your hole. Skim it off and throw it away. When the bubbles stop coming and the consommé looks clear underneath, then you‟re ready to take it out. Remove the pot from the heat and let it sit for ten minutes. 8. Removing the consommé from underneath the raft is another nerve racking procedure. You want to break as little of the raft as possible, but you have to get underneath it to remove the liquid. 9. Enlarge your hole with a ladle and spoon it all out as gently as you can. You can strain it if you want too but hopefully the liquid is clear. 1. Finely chop the chicken with food processor or cleaver. Transfer chicken to large bowl. Add sherry, soy sauce, pepper, coriander and spring onion; mix well. 2. For wontons, work with about twelve wrappers at a time, keeping remaining wrappers covered with plastic wrap. Spoon 1 rounded teaspoon meat mixture onto center of each wonton wrapper. Moisten with egg or water and gather edges around filling, pressing firmly at top to seal; cover and set aside. 1. Heat consommé or broth. 2. Heat oil in wok or large skillet over medium-high heat to 375°F/180°C. Add eight to ten wontons at a time, cook until golden and crisp, 2 to 3 minutes. Drain on paper towels. 3. Place the broth into your warmed bowls. Add 1 wonton and place the others beside the bowl. 5. If you have it add a 1 cm (1/3 inch) wide strip of edible gold leaf to each bowl. I split this into two days. Chicken stock on the first day, chilled and scooped the fat out. 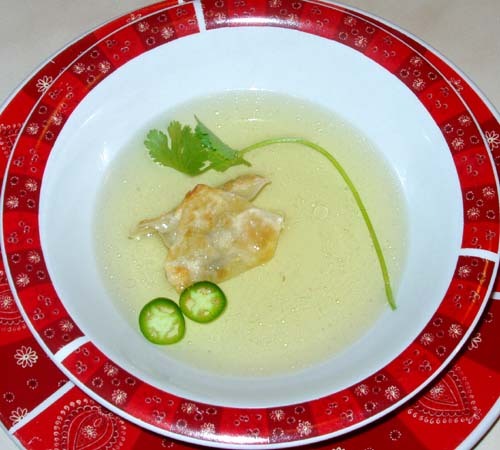 Then soup, wontons and consommé on the second day. The directions were fairly straightforward and detailed, so I didn’t see a reason to reinvent Peta’s wheels. When I sat down to eat it, I said “Ah, it’s pretty but I didn’t need it to be pretty.” By the time I was finished eating my first bowl, I’d decided that yes, it needs to be pretty like this if I do it again. The visual difference is astounding, and the time is totally worth it. The boy called this “Jimmy New-tonne Curry”. I think it was the fun pasta. Melt butter or fat in a large saucepan over medium-high heat. Add the onions and cook until desired doneness – I prefer golden brown, so about 10 minutes. Add paprika, chili powder, and salt and cook for 1 minute. Add the chicken pieces and stir them in the pan until they’re well coated in onion mix. Cook 3-5 minutes more or until all pieces of chicken look like they’re ready to braise (white all over or even browned on each side). Add tomatoes and cook 2 more minutes. Slowly stir in chicken broth until completely incorporated. Bring to a boil, then reduce heat and simmer, uncovered, 25 minutes. Remove from heat and slowly stir in sour cream. Return to heat for 2-3 minutes. Serve with potatoes, rice or pasta. Seen here with spätzle. I meant to spoon the chicken and sauce over my noodles. After I took this picture, I immediately mixed them all up together. 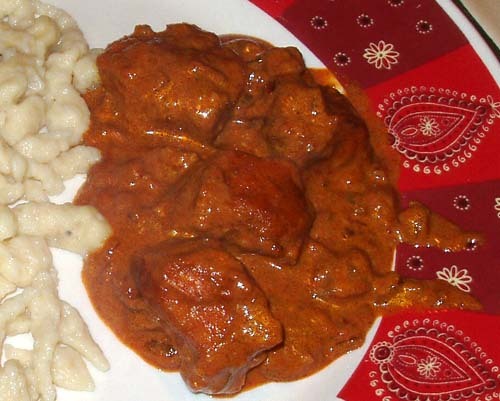 And I’m sure I’ll catch flack 20 ways from Sunday for saying this, but chicken paprikash is just a fancy name for HUNGARIAN CURRY. 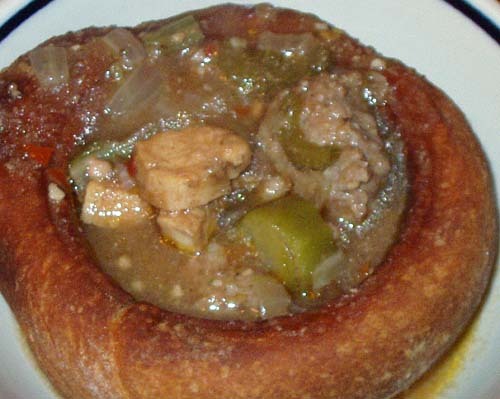 Our May hostess, Denise of There’s a Newf in My Soup!, challenged The Daring Cooks to make Gumbo! She provided us with all the recipes we’d need from creole spices, homemade stock and Louisiana white rice, to Drew’s Chicken & Smoked Sausage Gumbo and Seafood Gumbo from My New Orleans: The Cookbook, by John Besh. Total time: 2-5 hours, depending on how you manage your time, or if you’re using canned chicken broth. This took me exactly 3 hours and 24 minutes, including my bread bowls and chicken broth. 2 pounds (2 kilograms) spicy smoked sausage, sliced ½ inch (15mm) thick I left this out. Filé powder, to taste I left this out. Tabasco, to taste I left this out, too. And I added 1 Tbsp of red pepper flakes. I should have added a handful, since I like it warmer. Maybe next time. 1. Prepare homemade chicken stock, if using. The challenge came with a recipe, but I was making stock for several meals, so I did my own. 2. Prepare homemade Basic Creole Spices, if using. 3. Season the chicken pieces with about 2 tablespoons of the Creole Spices while you prepare the vegetables. 4. Make sure all of your vegetables are cut, diced, chopped, minced and ready to go before beginning the roux. You must stand at the stove and stir the roux continuously to prevent it from burning. 5. In a large cast-iron or heavy-bottomed pan, heat the chicken fat, duck fat, or canola oil over high heat. 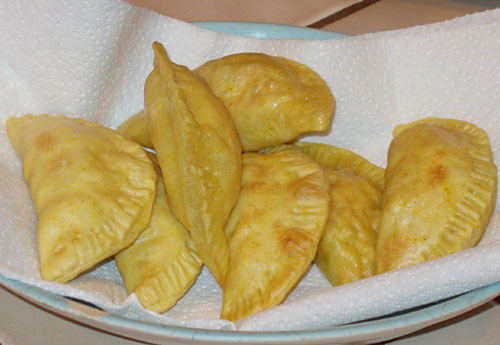 Whisk the flour into the hot oil – it will start to sizzle. **DANGER! IT SPITS!! ** Reduce the heat to moderate, and continue whisking until the roux becomes deep brown in color, about 15 minutes. 6. Add the onions. Switch to a wooden spoon and stir the onions into the roux. Reduce the heat to medium-low. Continue stirring until the roux becomes a glossy dark brown, about 10 minutes. 7. Add the chicken to the pot; raise the heat to moderate, and cook, turning the pieces until slightly browned, about 10 minutes. 8. Add the sliced smoked sausage and stir for about a minute. 9. Add the celery, bell peppers, tomato, and garlic, and continue stirring for about 3 minutes. 10. Add the thyme, chicken stock, and bay leaves. Bring the gumbo to a boil, stirring occasionally. 11. Reduce the heat to medium-low and simmer, uncovered, for 45 minutes. Stir occasionally, skimming off the fat from the surface of the gumbo every so often. 12. Add the chopped andouille, okra, and Worcestershire. Season with salt and pepper, several dashes of filé powder, and Tabasco, all to taste. 13. Simmer for another 45 minutes, continuing to skim the fat from the surface of the gumbo. Remove the bay leaves and serve in bowls over rice. Pass more filé powder at the table if desired. 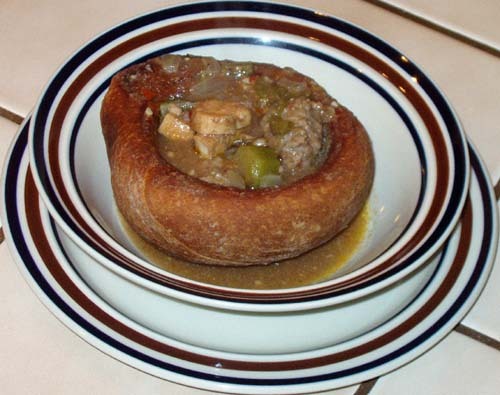 Seen here served in a homemade bread bowl. I didn’t think I’d like gumbo. I had some seafood gumbo as a kid (made by a really burly, wild Italian man), and I didn’t think I’d care for it this time around – BUT I DID! Not only that, but I really enjoyed it. I should have made a full recipe. Guy Fieri’s Satay Chicken Salad Wraps without some of the obnoxious recommendations. Total time: Approximately 2 hours. In a food processor or blender, combine all marinade ingredients until smooth. 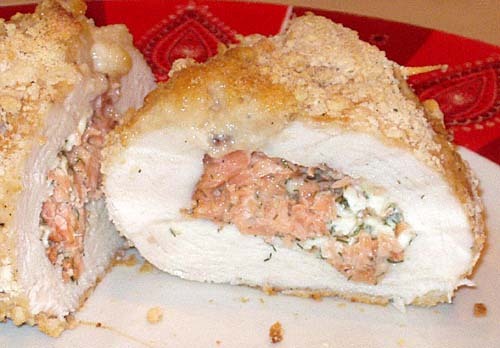 Place chicken and marinade in a plastic bag or other container and store in the refrigerator. Marinate at least 1 hour. Heat a large frying pan over high heat and add peanut oil. When the oil is hot, add the chicken, stirring frequently for 3 to 4 minutes. Once cooked through, remove the chicken to a plate and keep warm. To the same pan add the vegetables and saute for 2 minutes longer, remove to a bowl and keep warm. If using bean sprouts, now’s the time to add them into the frying pan with ginger and garlic and saute for 1 minute. Remove from the heat. I serve these “family style”, with fresh naan. To build a sandwich, I slather raita across the naan, then layer on the meat, warm vegetables, cold vegetables or fruits, then garnishes (and sometimes more raita). 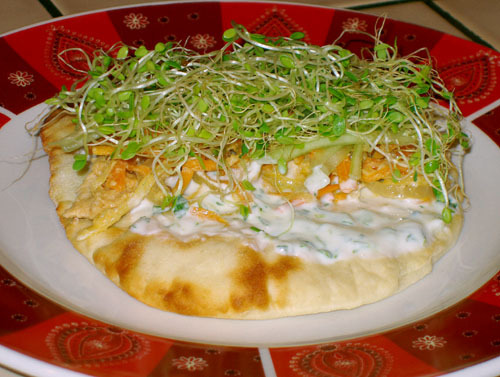 My favorite so far is chicken, carrots, onions, sauteed bean sprouts, cilantro and green onions, with the homemade naan and raita. In a small bowl, mix together feta, salmon, garlic, dill and salt. Using a sharp knife, slice open each chicken breast horizontally, almost all the way through, leaving the two halves attached. Open up the split breasts and lay them out flat. Place each piece of chicken, laid out flat, in a plastic bag or plastic wrap one at a time. Pound the chicken pieces to ¼-inch thickness. Scoop filling into the chicken breasts and seal them with 3 or 4 toothpicks. (Make sure you remember how many you use.) 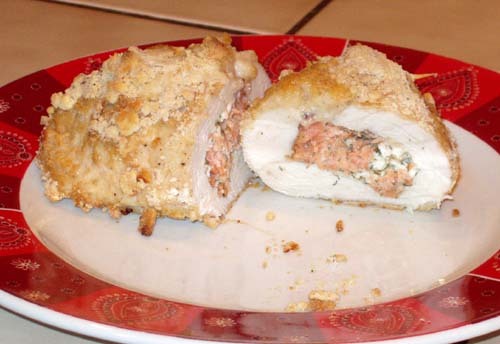 Roll filled breast in breadcrumbs. Repeat for the second one. Bake 45 minutes. Let cool 5 minutes before trying to remove those toothpicks. I use a glass baking dish whenever I bake meat. If you don’t have one, you’ll need to keep better watch on your chicken. Adapted from Clean Eating Magazine (March/April 2010). In a small saucepan, bring chicken broth to a boil. 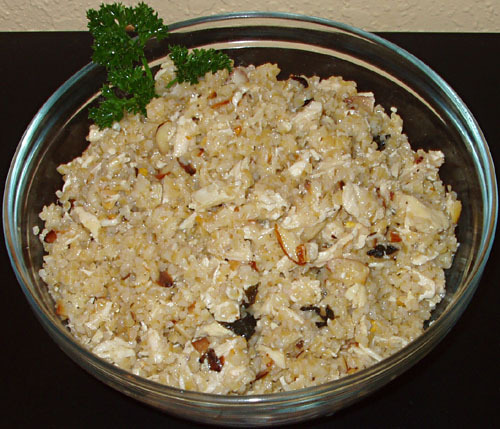 Place bulgur in a small-medium bowl. Add chicken broth to bulgur and let set for 5-10 minutes, until most or all of the broth has been absorbed. In a medium bowl, mix together oil, lemon juice, and seasonings. Add shredded chicken, and mix well to coat. Add almonds and mint, toss to coat. Add bulgur and mix well.